XR5 Data Logger for Temperature, Pressure, AC Current and more. The XR5-SE Data Logger simplifies data logging setup and operation. Compatible with over 70 sensors stocked at Pace. Also compatible with many 3rd-party sensors. All Pace sensors require no external power. The XR5-SE has 8 multi-range analog inputs, 3 pulse/frequency inputs, and millivolt / thermocouple range options. Features include sensor excitation, average and peak sampling, memory capacity of up to 260,250 readings (-M models) and real time data output. Logging modes include delayed start, wrap-around, cycle, log on alarm, and log on external trigger. Battery life is 2 to 4 years for typical applications. The XR5-SE includes 5.0 Vdc and 2.5 Vdc sensor excitation terminals. Excitation time is selectable from 30 milliseconds to 10 seconds. A Millivolt Option adds two millivolt ranges to each analog input, and all XR5-SE features and range selections are retained. The -20mv or -50mv option is recommended for Thermocouple applications. The -20mv option provides higher thermocouple accuracy. The -50mv option provides higher temperature ranges for some thermocouples. See pages 97-101 of the XR5-SE User's Guide for details. Pace stocks the PT450 Thermocouple Probe for thermocouple applications. All models have eight (8) multi-range analog inputs and three (3) pulse inputs. Models in left column can store 63,642 readings. Models in right column (-M models) can store 260,250 readings. Models with a millivolt option (-mV) have two millivolt range selections for each analog channel (while retaining all XR5-SE ranges and features) and include an internal precision temperature sensor (12th channel). IC209 Interface Cable (listed below) for setup and data transfers. Each XR-SE Data Logger includes batteries (2), terminal block and NIST Traceable Certificate of Validation. LogXR Software included with each order. 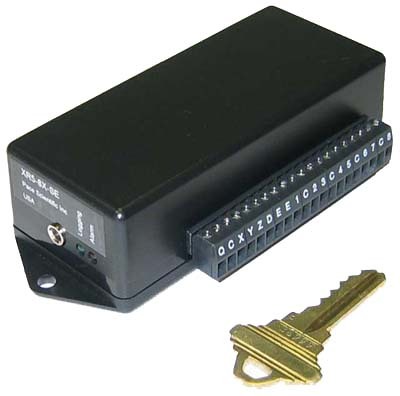 Pace Data Loggers are backed by a 3 year limited warranty. Accessories (sensors, probes, etc.) are backed by a 1 year limited warranty. IC211 Modem Cable $24. Connects XR5 to land-line modem. Contact Pace for recommended modem. Previously purchased XR5-SE models can be upgraded with a millivolt option and/or -M memory option for a nominal charge. Contact Pace for details. The XR5's Text Interface Mode does not use LogXR Software. XR5 sensor readings and other data are accessed by a terminal emulator or custom program. The Text Interface Mode does not support all XR5-SE functionality. Driver for discontinued USB-01 Serial Adapter is here.